A settlement has been reached between Kamehameha Schools and Brayden Mohica-Cummings, a seventh-grader and non-Hawaiian who sued to be allowed to attend the school. He entered court in August with his mother, Kalena Santos, and attorney Eric Grant, left. >> Na Pua Ke Alii Pauahi was the lead organization in collecting more than 84,000 signatures opposing a lawsuit challenging Kamehameha Schools' admission policy. A story on Page A1 Saturday incorrectly said the 'Ilio'ulaokalani Coalition collected the signatures. The Kamehameha Schools has agreed to settle a Kauai seventh-grader's lawsuit challenging its century-old admission policy, setting off a wave of criticism in the Hawaiian community. The $6 billion estate's five-member board of trustees voted yesterday to approve the deal, which will allow non-Hawaiian student Brayden Mohica-Cummings to attend the school's Kapalama Heights campus through the 12th grade. In exchange, Mohica-Cummings agreed to drop his lawsuit, which alleged that the school's policy of giving native Hawaiians preference for admission violates federal anti-discrimination laws. The settlement requires the approval of U.S. District Judge David Ezra, who plans to hold a hearing on the matter Thursday. It also requires approval from the state Family Court on Kauai, where Mohica-Cummings is a subject of a custody dispute between his mother, Kalena Santos, and his father, Kenneth Mohica. The estate's trustees stressed that the settlement does not set a precedent admitting more non-Hawaiian students. They believe that the deal will give them a better chance of defending the school's admission policy before the nation's appellate courts. "This was an extremely difficult decision for the board to make," said Nainoa Thompson, vice chairman of the estate's board. "In the end we all agreed that defending our right to offer admissions preference to children of Hawaiian ancestry is paramount for everyone -- for our children, for our community and for all of Hawaii." Eric Grant, Mohica-Cummings' attorney, said the settlement is in the best interest of his client. Grant said Mohica-Cummings' mother was "overjoyed" by the deal, which will secure a good education for her son. "The point of the lawsuit was to get Brayden in the Kamehameha Schools through the 12th grade," Grant said. "He achieved everything that he wanted." The settlement comes three months after Ezra issued a temporary restraining order forcing the school to admit Mohica-Cummings while his suit was being decided. Ezra did not rule on the merits of the case, but said that the school waited too long to reject the 12-year-old's admission. Earlier this year, the school admitted Mohica-Cummings to its Kapalama Heights campus after his mother, who was adopted by a Hawaiian family, said her son was Hawaiian. But the offer was rescinded after Santos was unable to document her son's Hawaiian ancestry. Members of the Kamehameha Schools ohana criticized the settlement, saying it will open the floodgates to challenges by non-Hawaiians who want to attend the school. Vicky Holt-Takamine, president of the 'Ilio'ulaokalani Coalition, which organized rallies and collected signatures from more than 84,000 people opposing the lawsuit, believes the trustees failed the Hawaiian community. "To me, this is the last icon for native Hawaiians. This is another overthrow of the monarchy," said Holt-Takamine, who met with Thompson yesterday to express her misgivings. "Do I feel betrayed and used? Absolutely. ... How do you explain this to the thousands of Hawaiians who get turned down? How do you explain this to the Hawaiians who didn't get in in the past, didn't get in this year and won't get in in the future?" Momi Cazimero, a 1951 graduate of the Kamehameha Schools, said she believes the board made "an expedient decision" given that Mohica-Cummings had already been enrolled at the school through error. Leroy Akamine, a 1952 graduate and a former president of the student-parent group Na Pua a Ke Ali'i Pauahi Inc., said the settlement essentially rewards an applicant "who lied and deceived the school in a selfish attempt to gain admittance." "We're devastated and disappointed by the decision that the trustees made," Akamine said. "It's a sad day for us." But not all school supporters disagreed with the board's decision. Roy Benham, former president of the Kamehameha Schools Alumni Association's Oahu region, does not see much harm in admitting Mohica-Cummings, who was raised in a Hawaiian atmosphere. Benham noted that prior to the mid-1960s, non-Hawaiian children of faculty members attended the school. "It was the school's error, and I think that under the circumstances I would let him attend," Benham said. 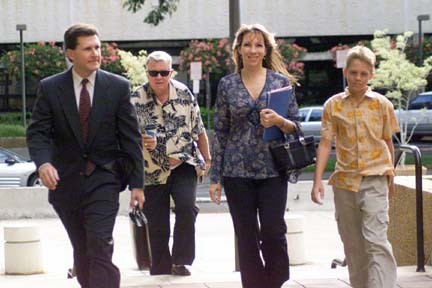 A settlement of the Mohica-Cummings lawsuit had been anticipated after U.S. District Judge Alan Kay upheld the school's admission policy in a similar suit by an unidentified non-Hawaiian student challenging the school's Hawaiian-preference system. In that case, Kay ruled that the school's admission policy was justified because it seeks to remedy past injustices and existing economic problems suffered by Hawaiians in the wake of the overthrow of the Hawaiian monarchy more than a century ago. Grant, who also represents the unidentified student in the second lawsuit, plans to appeal Kay's decision. Constance Lau, chairwoman of the estate's board, said the two lawsuits placed the estate in "a complicated legal position." Settling Mohica-Cummings' lawsuit leaves the trust with Kay's ruling, which is "extremely favorable" to the trust, she said. And even if Ezra were to have upheld the admission policy, there is a possibility that he could order a stay to keep Mohica-Cummings at Kamehameha while his appeal is decided, the trust said. Such an appeal might not be decided for three or four years, when Mohica-Cummings is in the 11th grade. "If our preference policy is struck down and we can't serve Hawaiians first, thousands of our children today and in future generations will suffer," said trustee Diane Plotts.